Arrayit SpotBot® Personal Microarrayers provide the world's finest desktop microarray printing systems at affordable prices. The Humidification System allows the user to quickly adjust and control the relative humidity inside the instrument box from ambient and 80% RH with -/+ 1% accuracy. For use with all SpotBot® 1, 2 and 3 Personal Microarrayers and Protein Edition Microarrayers. Connects to the back of the instrument panel using a barbed fitting. 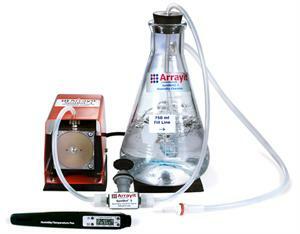 Minimizes sample evaporation during printing.